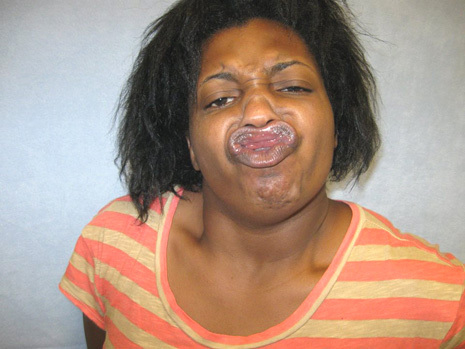 The duck-faced Cleveland woman was arrested Saturday and charged with obstructing official business after refusing to vacate a Quality Inn hotel room she and a male companion had rented the previous evening. When officers from the Wickliffe Police Department told her and her friend they needed to leave or pay for another day, Green, 34, allegedly became “loud and uncooperative and refused to identify herself” to cops. After a brief struggle, Green was arrested and transported to jail where she posed for the above mug shot before being released on $354 bond. She is scheduled for arraignment in Willoughby Municipal Court on July 24.